zarinahtakesapaycut: Serious questions for Mr John Weatherill, Professional Standards Committee ICAEW, to answer. Serious questions for Mr John Weatherill, Professional Standards Committee ICAEW, to answer. When young aspiring accountants in Malaysia, decide to study for the ACA under PricewaterhouseCoopers, so that they may one day become members of the Institute of Chartered Accountants in England and Wales, ICAEW, what exactly are the values they acquire under the training programme? Mr John Weatherill is the Head of Assessment and Conciliation, Professional Standards for the ICAEW. Perhaps it is time to remind the ICAEW of what exactly is considered as acceptable, in PwC Malaysia's reckoning, as far as ethics are concerned. 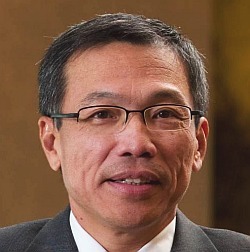 The MD of PwC Malaysia, Chin Kwai Fatt, who is yet to lodge a report with the MCMC or the Malaysian Police on this blog. The following are among the examples of 'proper behaviour' that the future members of the ICAEW, who are under training with PricewaterhouseCoopers Malaysia, will be absorbing in the mandatory 450 days of chargeable work that they must complete, before they can be accepted. And there is no better candidate whose actions we can pick as examples than that of the MD himself, Mr Chin Kwai Fatt. 1. If you find that the Chairman of the firm had signed a sworn statement, as Raja Tan Sri Dato' Seri Arshad had done in 2001, that a company called PricewaterhouseCoopers Consulting Sdn Bhd (464379-U) is a member firm of the global organisation of PricewaterhouseCoopers; just ignore that sworn statement when you are supposed to sell the consulting company to IBM Corp as part of a worldwide sale a year later. 2. What you must do instead, is this. Rename a company, as PricewaterhouseCoopers Consulting (East Asia) Sdn Bhd was renamed to PwC Consulting Sdn Bhd (289801-A), and transfer all assets and ongoing business from PricewaterhouseCoopers Consulting Sdn Bhd (464379-U) into that new company. Now, in order to ensure that you can defraud the creditors of PricewaterhouseCoopers Consulting Sdn Bhd (464379-U), you must make sure that the contingent liabilities are not transferred to the company that you have renamed. 3. After that, you must find a couple of people that you can name as Directors for the newly named company, before you can sell it to IBM, just like Ms Chu Kum Yoon, a company secretary, and Mr Foong Weng Chee, who has his own accounting firm, were named as the Directors for PwC Consulting Sdn Bhd(289801-A). Never mind that the two people that you picked have never been involved in the consulting business of PwC Malaysia in any way at all. 4. Remember that there is a clause in the no-action letter to the sale of the consulting business to IBM Corp issued by the SEC (US Securities and Exchange Commission) which states : "9) indemnification claims for certain losses must be made by IBM within two years of the closing and the aggregate amount of such claims may not exceed 12.5% of the purchase price;". Now, you do not want the several hundred million Ringgit in contingent liabilities arising from several lawsuits against PrciewaterhouseCoopers Consulting Sdn Bhd (464379-U) to become a part of that sale to IBM Corp worth USD$3.5 Billion, do you? Never mind that the creditors are defrauded from getting their just settlements, just make sure you keep those contingent liabilities in PricewaterhouseCoopers Consulting Sdn Bhd (464379-U) as far away from the sale to IBM Corp as possible. 5. Now, you must find a suitable auditor to audit the books for PricewaterhouseCoopers Consulting Sdn Bhd (464379-U), don't you? So pick a firm like Roger Yue, Tan & Associates. Never mind that one day their engagement partner will be charged by the Securities Commission for abetting a listed company in submitting inflated earnings to Bursa Malaysia, or how it would look when the largest audit firm in the country, like PwC, itself uses the services of a tainted auditor, just make sure you find the 'right auditor', okay? 6. Now, you need to keep those pesky contingent liabilities hidden don't you? So what you have to do is this. Just go ahead and sign in the annual returns for PricewaterhouseCoopers Consulting Sdn Bhd (464379-U), that the company can meet its liabilities as and when they may fall due. This is what your MD did in 2008 did he not. But ensure that sure you make no mention at all of the several hundred million in contingent liabilities the company has, alright. 7. Now, even if there is another sworn statement, this time from the current Chairman of PwC, Datuk Seri Johan Raslan, that states that the Court of Appeal finds the claims made against PricewaterhouseCoopers Consulting Sdn Bhd (464379-U) could not be said to be manifestly unsustainable, keep those contingent liabilities undeclared in the annual returns. Don't worry that you are signing a false declaration when you sign that the company can meet its liabilities as and when they may fall due, even though you did not ensure that the company can meet its cash flow solvency and balance sheet solvency tests. You know for a fact that there is no way PricewaterhouseCoopers Consulting Sdn Bhd (464379-U) can meet those two tests in the face of hundreds of millions of Ringgit of liabilities falling due, so why bother right. 8. Now you must ask yourself if you have done enough for the creditors of PricewaterhouseCoopers Consulting Sdn Bhd (464379-U). When the answer hits you as 'not nearly enough', do this. Get PricewaterhouseCoopers Consulting Sdn Bhd (464379-U) to be declared as having ceased operations in 2009. This way, you have ensured that it can never meet the cash flow solvency tests, and when you get a fellow director, like Khoo Chuan Keat to sign the annual returns for 2009 that the company can meet its liabilities as and when they may fall due, without disclosing the contingent liabilities, and doing the necessary solvency tests, you can finally rest easy that you have done everything possible for the creditors of PricewaterhouseCoopers Consulting Sdn Bhd (464379-U) over the years, that is, leave them as high and dry as possible, even if it means breaking a few laws and regulations along the way. 9. Don't get caught!!! But if you do, keep very very quiet. Don't reply to the allegations against you, and never, ever make a report to the police or the MCMC against any blog, such as this one, that exposes you for what you are. Remember, fraud, just like any other skill, takes practice. Chin Kwai Fatt has put the MOF in a tight spot! Datuk Seri Tony Fernandes - Be warned. Did PwC cook the Maxis books? PwC fraudsters doing consulting work for PEMANDU!